The average citizen rarely sees a heavy bar-ball except when it is being used on the stage by some vaudeville "Strong Man." Consequently Mr. Average Citizen gets the idea that if he used a bar-bell he would have to do the same enormous lifts which are customarily shown in "Strong" acts. The exhibition stunts you see performed by professional "Strong Men" have very little to do with the creation of strength. The professional does his training before he gets on the stage. For every one professional who does exhibition work, there are a thousand men and boys who use adjustable bar-bells for the purpose of improving their bodies. There are a great number of amateur lifters; but all these amateurs have put in several months at bodybuilding exercises with their bar-bells before they start the practice of actual lifting. I have never known a man to start training with the idea of becoming a professional, although I know several amateurs who have become so enormously strong that they have been induced by theatrical managers to appear professionally. If you train with bar-bells, you are not compelled to do any real lifting. 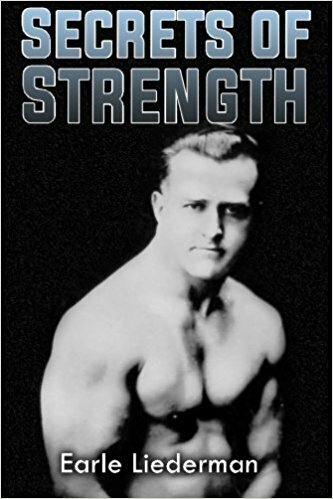 If your aim is to become beautifully built and enormously strong, you can achieve your ambition just by practicing the developing exercises described in this book. That part of the public which patronizes the theaters has very little interest in bar-bell and dumbbell lifting. They enjoy seeing "Strong acts"; but their preference is for marvelous and seemingly miraculous feats of strength. Therefore, professional lifters cater to the taste of their audiences. Instead of lifting bar-bells, they lift and support enormous quantities of live and dead weight. They try to make their acts spectacular. After you have practiced for a while with bar-bells, you will discover some very surprising things. For example, you will find that while it is difficult to "push up" to arms' length a 150-lb. 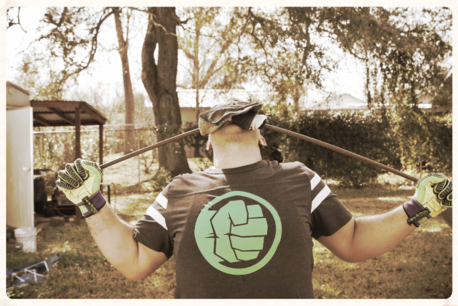 bar-bell, that it requires but little exertion to hold the bell aloft, once you have straightened your arm. Every professional lifter is fully aware of this fact, and it is quite natural that they should take advantage of their knowledge. In Fig. 100, you see a picture of a man walking while holding a bar-bell at arms' length. In doing this stunt he keeps his arm locked straight so that the bones of the forearm and upper arm are in one line. He keeps his back flat and walks with his knees slightly bent. Almost all the work is done by the thighs. If he arched his back and had his arm bent at the elbow he would find great difficulty in walking with the bell, but by keeping his arm and back in one straight line and walking with bent knees the feat becomes trivial. George Lurich, in his performance, used to walk across the stage while supporting Matysek walking with a bicycle and three men - a total weight of about 500 lbs. Eugene Sandow used to carry a small horse at arms' length. The horse was hauled in the air by means of a block and tackle. 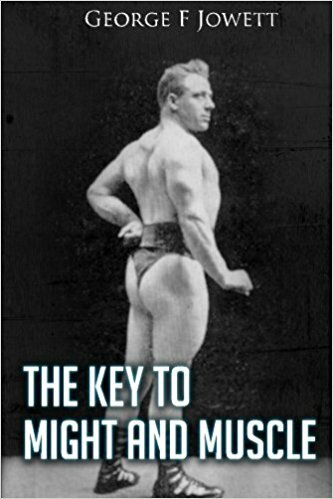 Sandow would stoop under the horse and grab hold of a loop on the side of a girth which passed around the horse's body. In performing this stunt, Sandow would lean forward and allow some of the horse's weight to rest on his shoulders. In Fig. 101 Matysek has bent slightly forward from the hips so that the lower part of the bicycle-frame rests against his back. Matysek would "push up" 250 lbs. with one arm; but he could carry 600 lbs. on the straight arm. Sandow could "push up" 271 lbs., and the horse he carried must have weight at least 800 lbs. 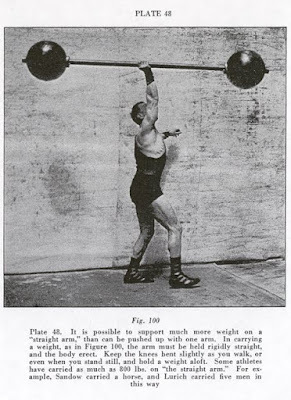 Sandow himself stated that after his arm was straight, he could carry almost any weight. I believe stunts like this to be entirely legitimate in stage work. If a man comes out and pushes up a 200-lb. bar-bell the onlookers are not very much impressed; because, to tell the truth, they do not know whether the record is 200 lbs. or 300 lbs. 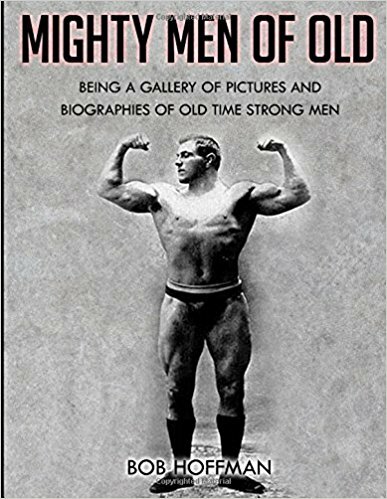 ; but the audience gets very enthusiastic when a man comes out and carries on his straight arm several hundred pounds of live weight, like the three men on Matysek's bicycle or like Sandow's horse. Another well-known exhibition stunt is the one illustrated in Fig. 102. After the athlete gets into the "bridge" position, an attendant places on his shoulder and knees the lower of the two planks. The upper plank, which supports the men, the horse, or the automobile, is place nearer to the knees than to the shoulders. Enormous weights can be supported in this position because most of the weight comes right over the knees, and is supported by the upright bones in the calves of the legs. Since the arms are straight, the bones of the forearm and upper arm are in one line, and each arm, in this position, is capable of sustaining a thousand pounds. I saw Sandow do this stunt with three horses on the plank and I have seen other men support automobiles. What the record is I don't know; but I have seen a 125-lb. woman support 2000 lbs. in this "human-bridge" position, and I believe that any amateur bar-bell user, after a few months' experience, could support over 3000 lbs. The foregoing stunts are more in the class of supporting feats than lifts. Another supporting feat is the one shown in Fig. 19, but instead of using a bar-bell the professional will hold in his feet a long plan and on this plank will be seated a dozen men. Supporting a great weight is easy in this position, after the legs are straightened; but as I said in Chapter IV, the strength of a man's thighs is so prodigious that a well-trained lifter can hold 1500 lbs. on the soles of his feet, as in Fig. 19, and then raise it an inch or two by straightening the legs. Saxon used to do this with close to 3000 lbs. ; that is, he would first lie flat on his back and raise his legs in the air. His younger brothers would then put the plank on his feet. Fourteen of the circus attendants would stand with their backs to the plank, and the two younger Saxons would pick up these men in pairs and seat them on the plank. After they were all in position, Saxon would bend his legs and lower the weight a couple of inches, and then again straighten his legs. Two of the Saxons used to lie flat on their backs and hold a bridge on the soles of their feet and a very heavy automobile would be run over the bridge. The strength of the bones of the hips is something phenomenal. A well-trained bar-bell user can lift anywhere from 1000 to 1500 lbs. by the "hip" lifts, which has already been described in Chapter V. After the weight has been raised by straightening the legs, you can then straighten up the body without much difficulty. If you stand erect, with he legs straight and the feet a few inches from each other and firmly braced, it takes a tremendous weight to make you bend your legs again. The first exhibition work of which I ever heard was performed by a German nearly two hundred years ago. In one of his stunts he would stand on a high platform. Around his hips was a strong belt, and from this belt a chain went through a hole in the upper platform; and its bottom end was hooked to a large cannon which weighed over a ton. This cannon rested on a wooden platform which, in turn, rested on a pair of rollers. The athlete stood with his legs straight at the start. The stage attendants would knock the rollers from under the lower platform and the athlete would stand there with the cannon hanging from the chain which was attached to the belt around his hips. Note that the man did not lift the weight, he merely supported it. As he was a very large and powerful individual, he undoubtedly could have lifted 2200 or 2400 lbs. in a "hip" lift; so it was perfectly reasonable to believe that he could have supported nearly twice as much after the legs were straightened. This man invented a lot of other "strength" stunts in the nature of supporting feats, and those stunts are performed on the stage up to this very day. A professional "Strong Man" should not be blamed for giving a performance of this character. His business is to perform a sensational act; and it stands to reason that the average audience will be much more impressed if he uses weights that can be counted by the ton, rather than weights that can be counted by the hundredweight. I do not want to give you the impression that any man can get up and do the sensational supporting feats that we see on the stage, because it takes a great deal of bodily strength to give such a performance. The thing you should learn is that many of the stunts which appear to be performed by the strength of the arms are really performed by the strength of the whole body. The average man can't lift 500 lbs. from the ground, and if he tried to walk with that weight on his shoulders, his legs would buckle at the knees and he would crash down in a heap; but a trained man like Matysek or Sandow can stride along easily while supporting 500 or 600 lbs. on the upraised arm. In men like these two, the back and the legs are so strong that it is a simple matter to carry several hundred pounds on the upraised arm. If your back and legs are strong, you can stand erect and hold a great deal of weight on your shoulders. Fig. 103 shows an amateur walking with about 900 lbs. supported on his shoulders. If this young man stood erect with his legs straight, as the man is doing in Fig. 104, he could support 1500 or 1800 lbs. ; but here he is walked with close to 1000 lbs. As has already been told, Barre walked several yards with a 1450-lb. bar-bell on one shoulder, and it is possible that he could have walked with 2000 lbs. across both shoulders. You can't get the strength to perform supporting feats just by pushing dumbbells or bar-bells to arms' length above the head. To do supporting feats, you need enormous back strength and leg strength; and to develop that kind of strength, you have to practice the leg and back exercises described in Chapters II and IV. After a few weeks' practice of those exercises, you would be able to give quite an impressive show, if you were asked to appear at some amateur entertainment or at a Y.M.C.A. carnival. 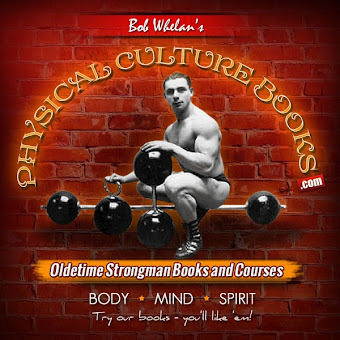 Back and leg strength will help you more in the ordinary duties of life than will arm strength alone; and that is why I am so insistent on the necessity of creating bodily strength by developing the back and legs. 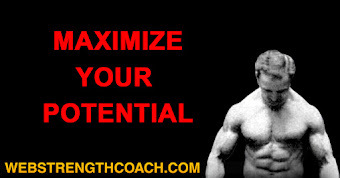 After you have created strength, you should know how to use it to the best advantage. The combination of your strength and skill will enable you to handle four times as much weight as will the average husky day laborer. For instance, if you saw a bunch of workmen amusing themselves at noon hour by an impromptu lifting contest, you would find that they were using the ordinary "dead-weight" style; that is, they would put the weight to be lifted in front of them and stoop over, as in Fig. 14. Then they would stand erect and hold the weight as in Fig. 15. This is what we call the "dead-weight" lift. Most of the workmen would be unable to stand up in this way with 350 lbs., but if you had developed your back and legs by performing the exercises in Chapters II and IV, you would probably be able to stand up with 450 or 500 lbs. But if you wishes to show them, what really could be lifted, you could employ the "hand-and-thigh" method, illustrated in Fig. 16, or the "Jefferson" lift in Fig. 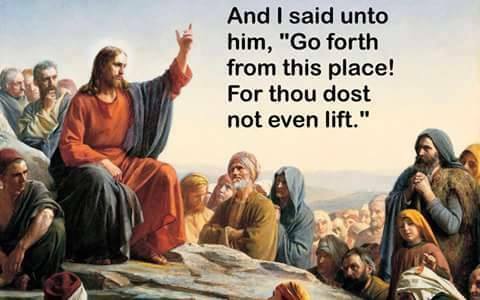 18, and amuse those workmen by lifting 1000 or 1200 lbs. a couple of inches from the ground. Never let your enthusiasm for "putting up" bar-bells make you neglect your practice of the leg and back exercises; because leg and back exercises make bodily strength, and it is bodily strength which appeals to the average man. In a football game, when a burly player gains ten yards while carrying four or five of the opposite players on his shoulders and back, he is doing a great feat of bodily strength, and just as admirable a feat of strength as if he were walking with a 1000- or 2000-lb. weight across his shoulders. 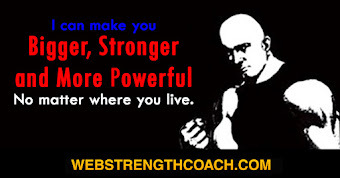 The great thing is that if you practice back- and leg-lifting, you can develop just the kind of strength which would enable you to make 20-yard gain while dragging or carrying half a dozen of the other team; the kind of strength that would enable you to lift one end of an automobile, and to do other stunts of that kind. The professional "Strong Man" is an adept at this kind of work. he is the very last word in combined strength and skill. Most professionals are very different in private life than when on the stage. I know some of them who would prefer to give a straight lifting act, but if they did that it would mean that they could get no engagements. Therefore they have to do sensational stunts, and the theatrical manager has a great habit of exaggerating the amount of weight which the athlete uses in the act. If a "Strong Man" tells the manager that he is going to support or lift 2000 lbs. in a certain way, the manager will go immediately to the printing office and get out posters saying that the athlete is going to lift 5000 or 6000 lbs. in that manner. 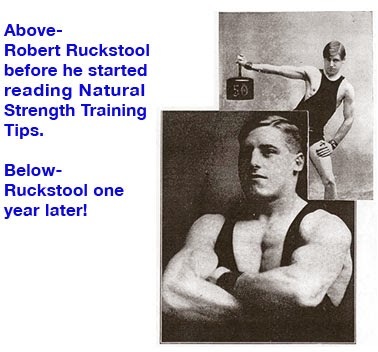 The manager of a vaudeville theater has the fixed delusion that no one will come to see a "Strong" act, unless the athlete is billed as "The Strongest Man in the World." Hence, every new "Strong Man" at his first appearance is billed in that way. In the last twenty years I have seen at least fifty different professionals, each and every one of whom claimed to be "the strongest man on earth." AT the present time, there are seven professionals making that claim.